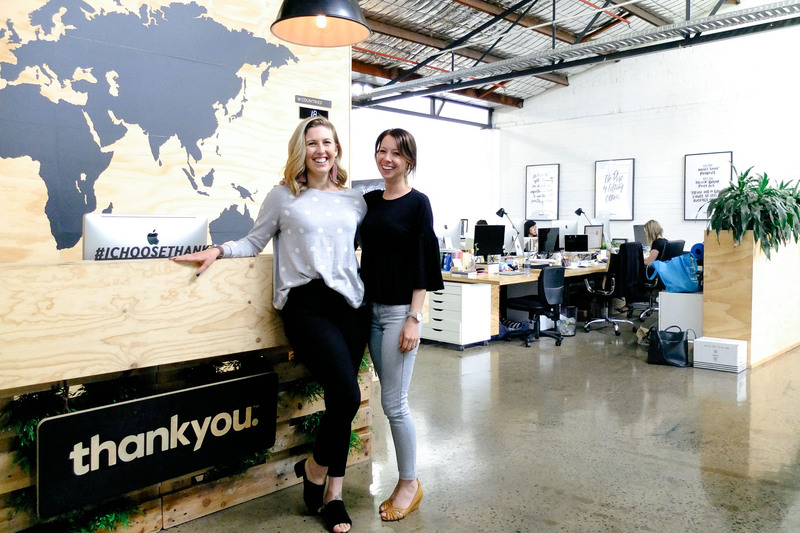 If you’re based in Australia you’ve likely heard of Thankyou before – a social enterprise selling a variety of products ranging from food and water to body and baby care. 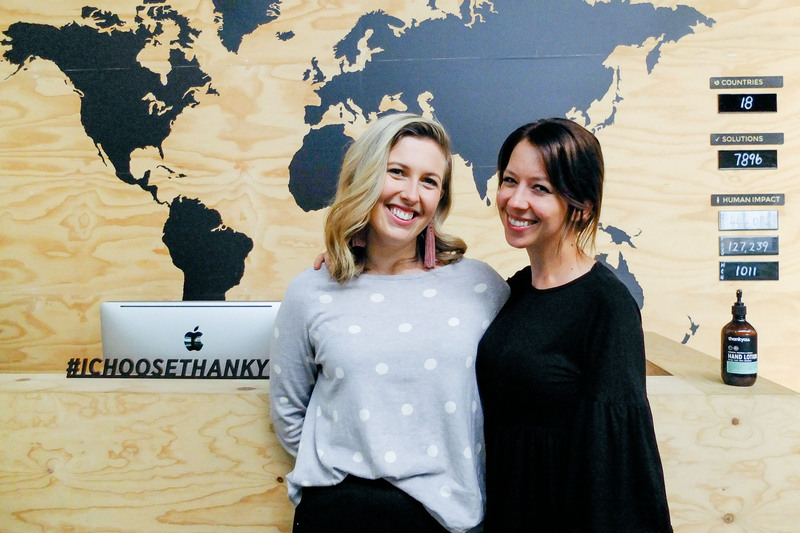 Thankyou is all about taking a holistic approach to combating poverty, with 100% of their profits funding safe water, food and hygiene and sanitation services around the world. With Thankyou’s offices being located just around the corner from elevio, it made sense to chat to them about customer service and building relationships. Most of Thankyou’s customers have an emotional attachment to the brand, so coming from a completely different industry than SaaS guaranteed some new insights and lessons that we can all learn from. 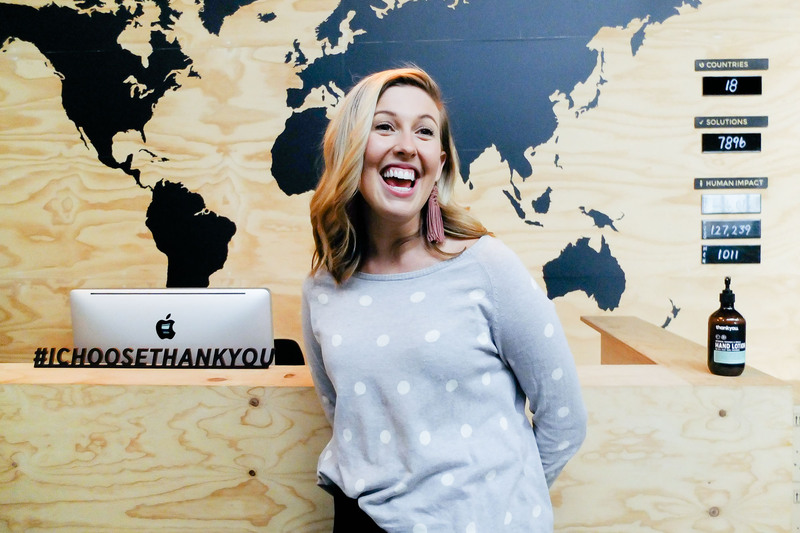 I talked to Kate, Customer Experience Lead of Thankyou, about structuring the day to achieve her goals, having real conversations, and creating a positive lasting impact on customers. What’s your background? How long have you been with Thankyou for, and how did you end up there? Before Thankyou I was working at a Melbourne bedding brand called Kip & Co. I was facilitating a lot of their e-commerce management and customer service. Jess from Thankyou’s People & Culture team dropped into our warehouse to return something. I gave her a tour and we hit it off straight away. I asked about her background and she told me she worked at Thankyou. I got very excited as I was in love with what Thankyou was all about. A week later I got an email from Thankyou asking if I wanted to come in for an interview for the Customer Experience role. I’ve been here for 11 months now. What does Customer Experience involve for you? Customer experience for us is the end-to-end experience.The customer experience team at Thankyou works with the Marketing team to respond to comments on all social media channels and all communications online and offline. Our responsibility is to ensure all customers who interact with Thankyou feel heard, valued and have a first class ‘wow’ experience. Talk us through your day – what does a typical day look like for you, from waking up until going to bed? I usually wake up around 6.30am and do a bit of Pilates (or not, sometimes I prefer to sleep in). I get to work around 8.30am. So everyone in the team has an opportunity to have a chat with other team members, we all enter and exit the office on the opposite level to where we sit. When I get to my desk, I’ll plan out my day and what I want to achieve. I have a weekly, monthly, and day-by-day planner to help me strategise and make sure we’re always moving forward. The team is two members strong, with Natanya (our Customer Experience Agent – see picture above) and I. We meet every morning briefly to go over the day’s tasks and get on the same page. We have a fortnightly meeting called Team News Time (TNT) that our entire team attends. This is where each department can share updates from their area and everyone can be on the same page. We also have weekly one-on-ones with our manager. My manager is the General Manager of Marketing so we sit down and plan out a strategy for the year, for the quarter, and then break it down into goals. Everything is so team and goal orientated. We have a Learning Engagement Achievement Plan (LEAP) which is a document that we set and review each quarter. We talk about what we want to achieve personally (e.g. do pilates three times a week, read a book, etc. ), and professionally achieve in our role. Generally, we have 10 key projects for the quarter. At 12.30pm every day we have lunch hangs. Often your problem solving throughout the day needs some output, so we always make sure we have lunch together. It’s just taking half an hour out to chill and build relationships together. We try to avoid having lunch at our desk, unless it’s campaign time. I think that work life balance is really crucial to success. What makes you passionate about being part of the customer experience team at Thankyou? We’re a little bit different to most FMCG (fast moving consumer goods) organisations because we are really a consumer movement. We would not be able to do what we do without people buying our products and advocating for our brand. In reality, it’s really the people who are keeping us in business and making the difference. In eight years, through people buying Thankyou products, we’ve provided safe water, sanitation, food and child and maternal programs to over 750,000 people around the world. For me, these people, our customers, are heroes. They’re just as much a part of this team as we are. It’s important they’re cared for and have an amazing experience with our brand. We want to ensure our customers are kept up to date with everything that’s going on with Thankyou so they can make that decision – this is why we do what we do. They are not just customers, they are movement builders for positive change. That’s huge. I’m really passionate about the ‘why’ behind what we do. What are some of your struggles when it comes to customer support, and how do you overcome them? Obviously there are challenges in every role. For us, it’s getting all the correct data and information to the right people, quickly. Realistically, that doesn’t always happen. Getting the right data from our innovation team, from our incredible manufacturers, from our suppliers, from all of our supply chain, … it’s a challenge since there are so many different channels. We’ve been able to navigate this through fortnightly meetings with all our different managers and our customer experience team. We go through all of the trending issues and the things people want to know. It’s about communicating the right information clearly and since this meeting has come into place it’s become a lot more streamlined. Any time the customer experience team gets a question from a customer, it’s first priority for all of our team. We always want to be able to bring a fast and educated response to our customers. How do you create community and relationships, with both your customers as well as other customer experience/support people? We see every single one of our customers and consumers as a VIP. We’re a consumer movement, without them we wouldn’t be able to do what we do. That means we’re always building relationships to be lasting. The way we do that is by being real. We always bring our personality to wherever we are. So if someone has an interaction with me, it would be completely different to what they’re having with Natanya because we’re both different people. We bring our flavour to every interaction. We try to avoid generic responses. We always want to make it personal and tailored for each person. A lot of the time they actually just turn into incredible conversations. It’s about keeping the door open and letting our customers know that there’s someone at Thankyou that they can talk to any time. We hire people with the right attitude and heart, as well as qualification. What do you believe is the most important thing in customer support? What creates loyal and returning customers? For us, it’s our attitude towards customers. I’ve been in environments before where customers were seen as an inconvenience, rather than the biggest asset of a company. We have this motto called “Go above and Beyonce”. I was on the phone to this wonderful mum, and I said to myself, would I be giving her the same service right now if she was Beyonce? It was a challenging moment, where I had to ask myself, could I be better at this? Is this my best? I made a decision that moment that every customer is a VIP. Part of that is empathy and actively listening, not just listening to find a solution. That means we have to be educated on our products to be able to offer the right answer quickly and to meet our customers where they’re at. The main thing is really just treating them like they are the most important person to you right there and then. Another thing is that we value relationships over response time. Quick response times are awesome, but the relationships that you build will definitely trump any response times. ROI on customer support as well as customer happiness are both hard to measure. How do you do this creatively? It’s kind of like marketing, it’s hard to tangibly measure customer support and the holistic view of customer experience. There are basic levels, like satisfaction ratings for example. But we also think word of mouth is so powerful. If someone has an incredible experience, they’re going to tell people. But if someone has a really bad experience, they’re probably also going to tell more people about that. So we look at it from the point of view that every product we sell is “more dollars to impact”. There are people on the other side of that. If we invest into incredible customer experience more people will know about Thankyou, more people will buy Thankyou products and more people around the world will be impacted positively. That’s a small way of creatively measuring ROI. But in the grand scheme of things it’s challenging. As we’re a social enterprise, there’s an emotional attachment to our brand. A lot of people will offer feedback freely, whether constructive or positive, which is really helpful. We always take on feedback openly and action it. We track that feedback and always take note of it, because that actually is the ROI. We aim to have five positive comments about our customer service a month. That’s a small way of how we track ROI. When people actually go that next step, when they tell us they’ll definitely buy our products again and that they’ll definitely tell their friends about us, that’s the tangible ROI. What’s next for you? Where do you want to get Thankyou, and what impact do you want to have on their success and growth within the next year or so? I really just want to see Thankyou winning and changing more lives than ever before. How we’re going to do that? Well, we’re going to continue to grow in our understanding of what our customers need and want and continue to learn how to provide that consistently. We think that happy will be loyal and that actually means not just a happy customer, but an empowered one. The have incredible power – with every purchase they are helping to end global poverty. Sign up to the newsletter below for more interviews to come and creative tips on customer success.